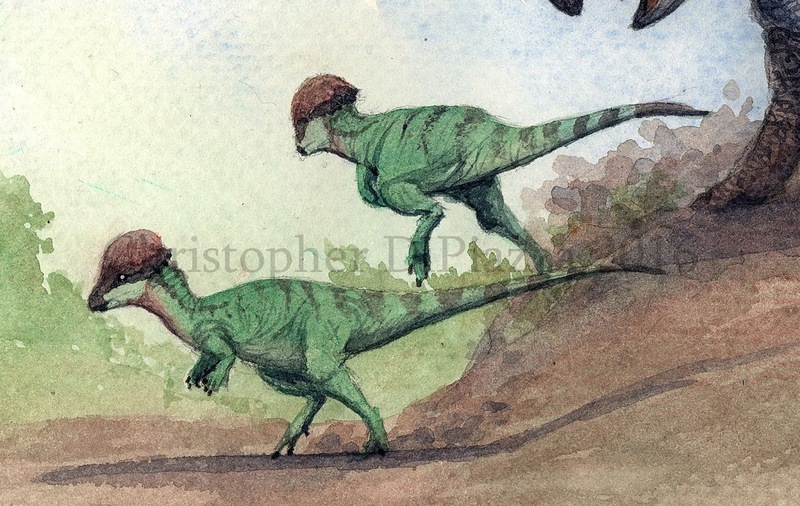 This week we shall be checking out a relatively small, but successful round-headed dinosaur. Say hello to Sphaerotholus! Sphaerotholus, was a pachycephalosaurid dinosaur, related to the much more famous, Pachycephalosaurus, that lived in what is now North America, including New Mexico and Montana, USA, as well as Alberta and Saskatchewan, Canada, during the late Cretaceous period. The genus includes three species, that together, spanned from 76 to 66 million years ago. When alive, Sphaerotholus would have been a plant-eater and could have measured roughly six feet from beak to tail, based on the very fragmented fossil material that is actually known from it. (basically just the top of the skull.) We can also guess roughly how large it was by comparing it to more completely-known, similarly-sized pachycephalosaurids, like Prenocephale and Stegoceras. Sphaerotholus' genus translates to "ball dome" in reference to the top of it's head...which was quite spherical. Sphaerotholus goodwini, from New Mexico, life reconstruction by Christopher DiPiazza. Unfortunately not too much is known from this dinosaur. Despite the fact that there are three named species, all the specimens consist of fragments of the top of the skull and very little else. What we do know, is that even for a pachycephalosaurid, it had a particularly rounded and thick skull. The nodes (small horns/bumps surrounding the dome) were arranged in a unique way, as well. Interestingly, pachycephalosaurids actually exhibit quite a bit of variation among species when it comes to head ornamentation and Sphaerotholus was at the derived end of this family tree, regarding cranium thickness. Some experts have suggested that Sphaerotholus should really be sunken into the same genus as a more completely known, close relative, called Prenocephale, which was native to what is now Mongolia, but so far the material from Sphaerotholus has proven to be different enough to hold this off for now. 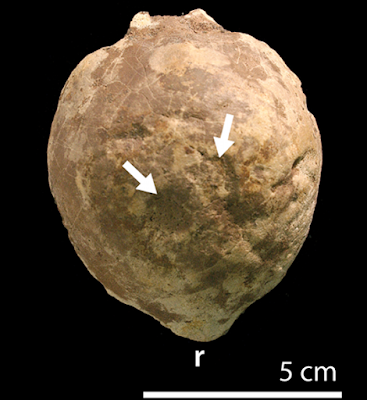 Dorsal view photo of a Sphaerotholus buchholtzae dome, from Canada, held at the American Museum of Natural History, from Paterson's 2013 paper. Arrows are pointing to injuries possibly from head-butting behavior. That is all for this week! As always feel free to comment below or on the facebook page! Carr T. E.; Williamson T. D. (2002). "A new genus of highly derived pachycephalosaurian from western North America". Journal of Vertebrate Paleontology. 22 (4): 779–801. Longrich N. R.; Sankey J. T.; et al. (2010). "Texacephale langstoni, a new genus of pachycephalosaurid (Dinosauria: Ornithischia) from the upper Campanian Aguja Formation, southern Texas, USA". Cretaceous Research. 31: 274–284. Mallon Jordan C.; Evans David C.; Tokaryk Tim T.; Currie Margaret L. "First pachycephalosaurid (Dinosauria: Ornithischia) from the Frenchman Formation (upper Maastrichtian) of Saskatchewan, Canada". Cretaceous Research. 56: 426–431. Peterson, Joseph E., Collin Dischler, and Nicholas R. Longrich. "Distributions of Cranial Pathologies Provide Evidence for Head-Butting in Dome-Headed Dinosaurs (Pachycephalosauridae)." Docs.com. N.p., 16 July 2013. Web.